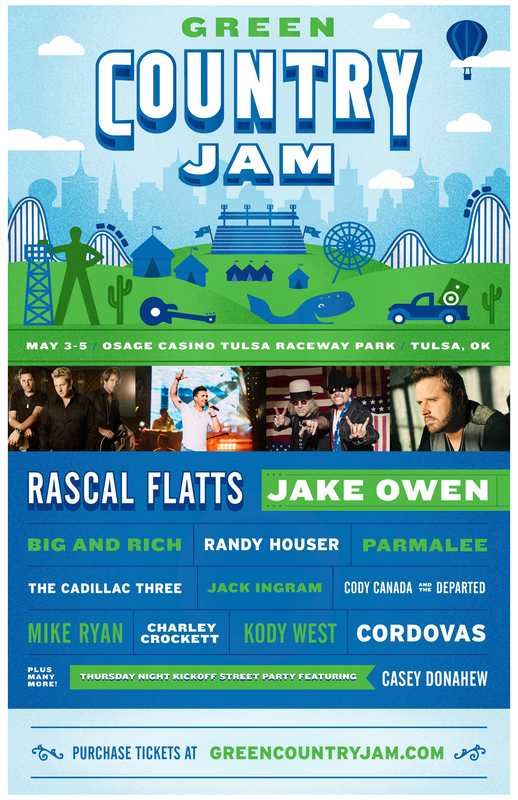 TULSA, OK – Rascal Flatts and Jake Owen will headline the Main Stage along with country music superstars Big and Rich, Randy Houser, Parmalee, and The Cadillac Three located at Osage Casino Tulsa Raceway Park May 3rd thru the 5th in the heart of Tulsa, Oklahoma. Also, there will be a Red Dirt Stage that will feature artists Jack Ingram, Cody Canada and the Departed, Mike Ryan, Charley Crockett, Kody West, and Cordovas plus others during the day on Friday and Saturday. Green Country Jam 2018 will kickoff on Thursday Night May 3rd with a special Street Party starring The Casey Donahew Band that will focus on community pride and raising monies for local charities. Other exciting attractions will include a carnival and midway, a kid’s area, yard games, arts and crafts, and exhibitor displays. Food and beverage options will range from pop up restaurants to food trucks as well as domestic and craft beers to creative signature cocktails. Gates will open at 3pm on Thursday and Friday and at Noon on Saturday. All ages are welcome. Tickets will go on sale Friday December 1st at 10am and prices start as low as $50 per day at www.greencountryjam.com. FOR A LIMITED TIME ONLY! For every ticket purchased you will receive a free Thursday Night Kick Off Street Party ticket starring The Casey Donahew Band. Other ticket options include up front Party Pit, Reserved Seating, General Admission, and VIP Country Club Tent Passes.